The chicken kathi roll or simply “chicken roll” as it’s known as in Kolkata (the birth place of this mouth watering treat) is my favourite street food snack. Ever. When you try it, you’ll know why. The classic chicken roll combo features a soft paratha layered with a fried egg, spicy chicken pieces traditionally cooked in a tandoor and red onion slices pickled in lime. Tastegasm much? (That is a word in the dictionary by the way. Well, The Urban Dictionary – but a dictionary nonetheless). 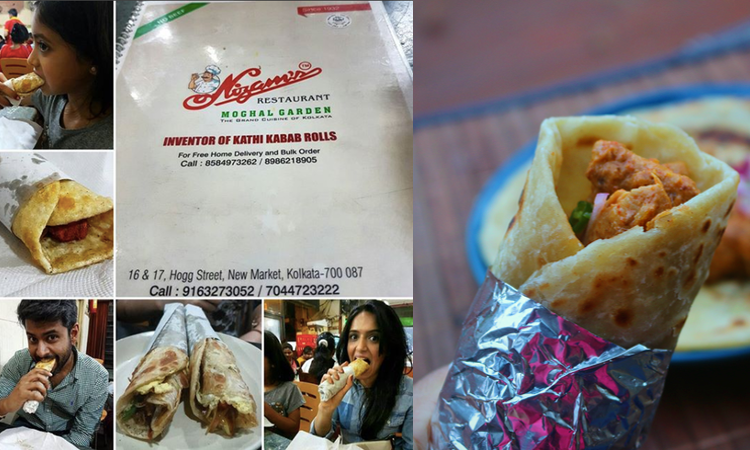 On my first trip to Kolkata I ate loads of these and dragged my family to Nizam’s – the restaurant that “invented” the Kathi Roll. I can’t verify that fact, though what is certain is that their rolls were unbelievable. When I returned home I was itching to recreate them. The kathi roll purists may note I have made a tweak to the classic (omitting the fried egg to make it slightly lighter) but my recipe still packs a punch and leaves you wanting more. Promise! Turn on your grill at the highest temperature setting & line a baking tray. Place all of the “to make the chicken” ingredients in a bowl & mix well. Scatter the chicken pieces on the baking tray & place in the grill for 12-14 minutes or until fully cooked and remove from grill. (The chicken should be white all the way through). Heat mustard oil in a pan. Add the onions & cook until light golden. Then add the grilled chicken & mix. Sautee for 2-3 minutes. Remove from heat. Check for salt and adjust accordingly. To make the salad, combine all ingredients together in a bowl. Allow to rest for 5 minutes. Taste for sweetness/sourness and adjust accordingly. 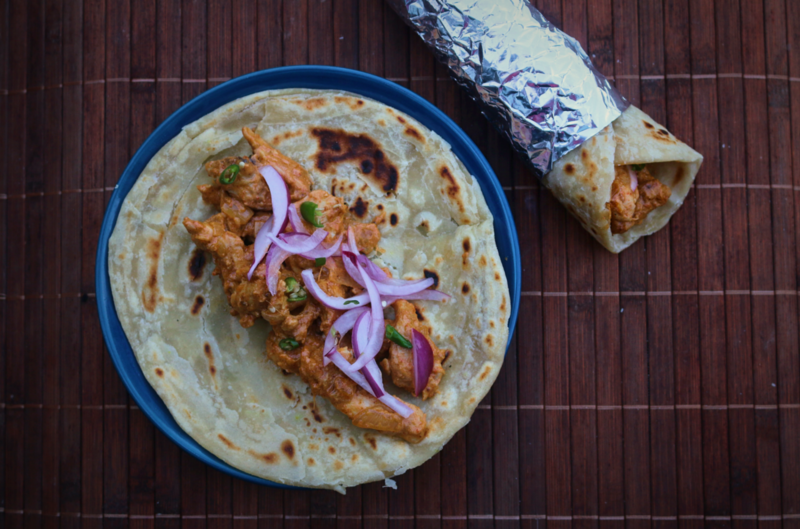 To assemble the kathi roll, place a paratha on a plate, top with chicken and onion salad (as pictured) and roll up in foil. 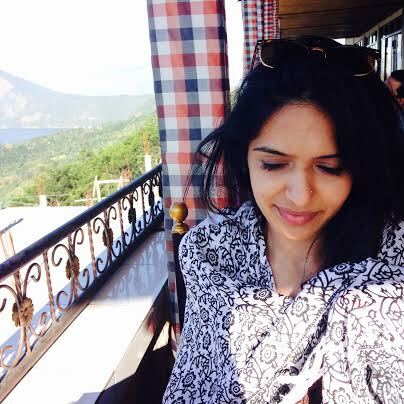 You can use paneer, red onions and green peppers instead of chicken to prepare vegetarian kathi rolls! 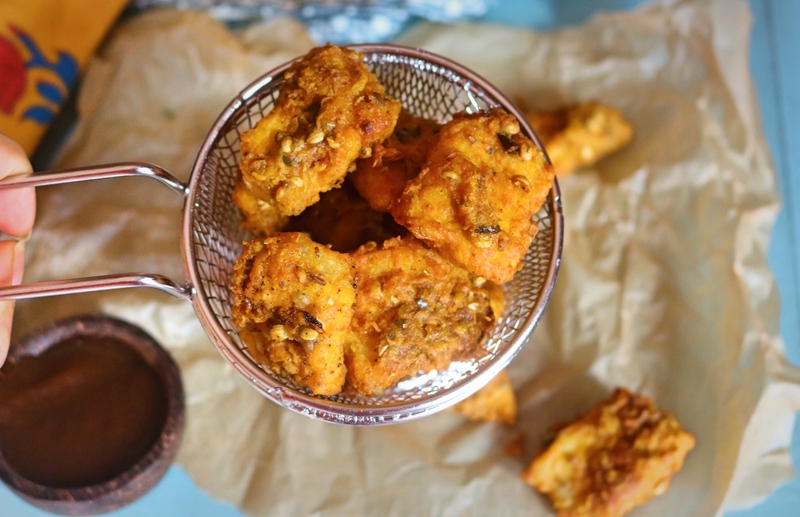 Fish pakoras are my absolute favourite, so I was really excited to see that you guys totally agree – you voted to see a recipe for these in last month’s Twitter poll. 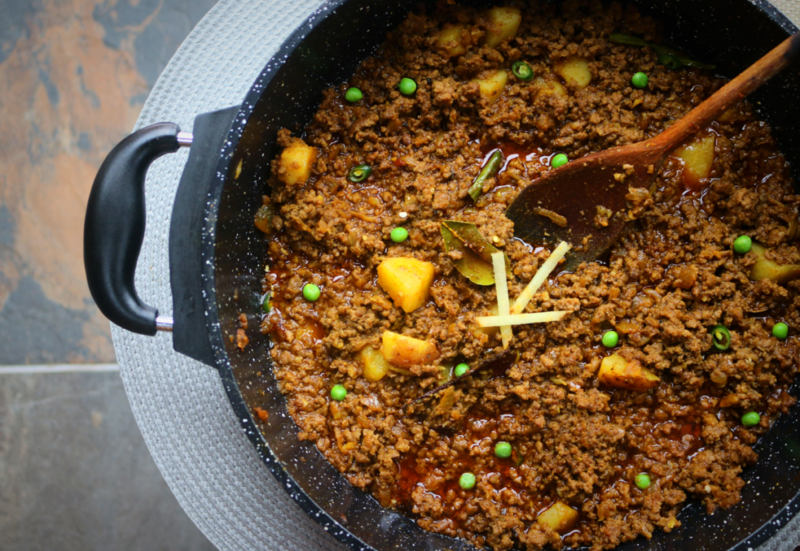 I apologise it has taken me a little longer than usual to get this out to you, but I’ve been super busy setting up the The Spice Club’s new cookery classes in Birmingham (Eeek… can’t wait!). I appreciate the last couple of posts have focused on “deep fried goodness” – clearly a sign that my body is going into hibernation mode, but I couldn’t resist. I really hope you enjoy these delightful morsels of deliciousness. Let me know what you think! Tweet/facebook/insta me….heck linkedin me if you must. I love feedback. Place all the "fish marination" ingredients into a bowl and mix well. Leave aside for 20 minutes. Heat oil in a pan (a small wok type pan works best) on a low heat setting. To this bowl, now add the "batter" ingredients and gently combine everything together (it is best to use your hand to do this). Every piece of fish should be well coated in a thick paste like batter. 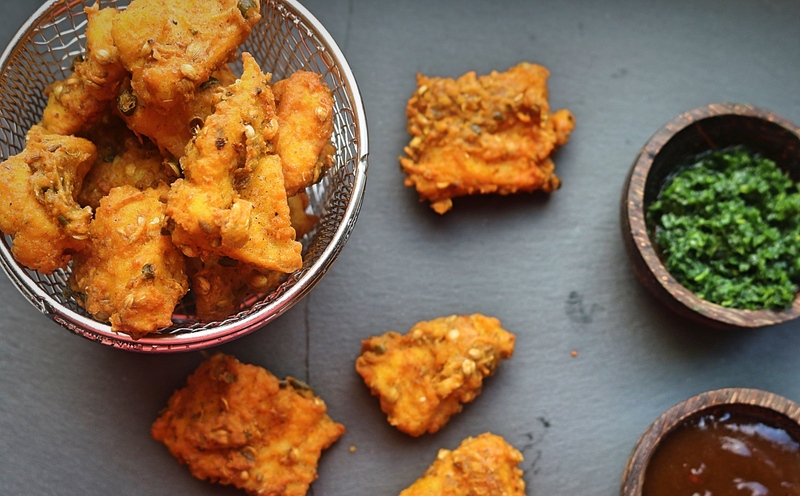 (You may need to adjust the amount of gram flour or yoghurt to achieve this thick paste consistency). Increase the heat of the oil pan and test the temperature of the oil by adding in a small piece of fish/batter. It should take about 5 seconds for it to rise from the bottom of the pan to the top. Now carefully add the fish pieces to the oil. 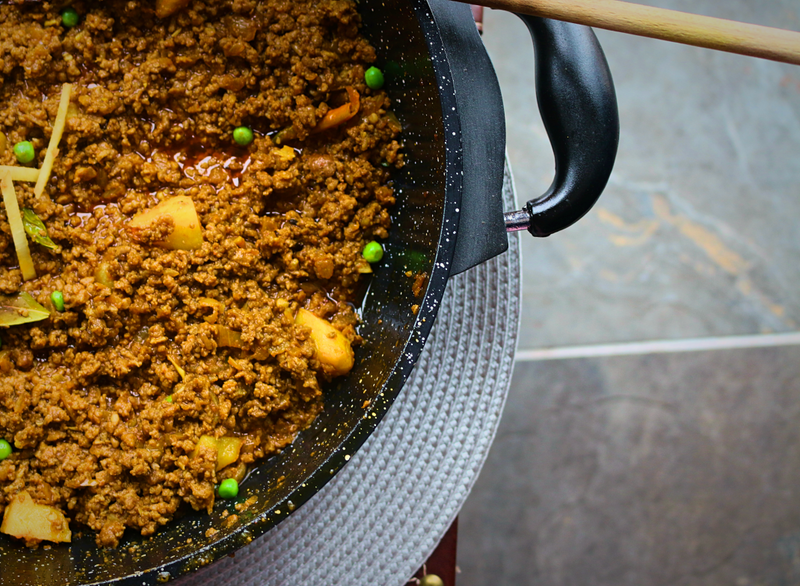 Cook in batches and do not overcrowd the pan. Fry on medium heat for 4-5 minutes. Each piece should be crisp and golden all over. Remove from oil and drain on kitchen paper.